Only three more weeks until Winter Break, and boy, am I ready for it! We are excited to put up our Christmas tree this weekend, even as we worry that our crazy pup Cisco will likely growl at it or even knock it down! I also bought some cotton batting and snowflake cutting and decorating materials for the library--we are going to turn it into a winter wonderland this week! Oh, the glitter! This week is a relatively unremarkable one in the world of new book releases. 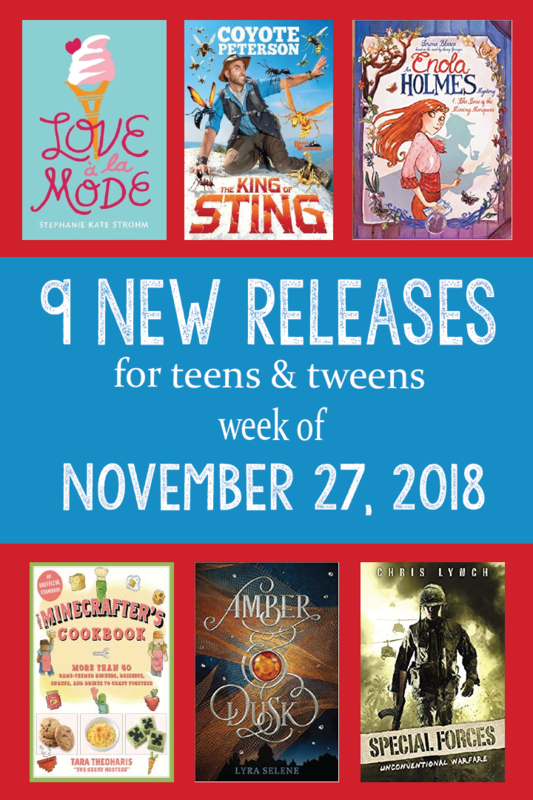 I found nine books releasing this week, but the two books that stand out most to me are Love a la Mode (YA) and the Minecrafter's Cookbook. Rosie Radeke firmly believes that happiness can be found at the bottom of a mixing bowl. But she never expected that she, a random nobody from East Liberty, Ohio, would be accepted to celebrity chef Denis Laurent's school in Paris, the most prestigious cooking program for teens in the entire world. Life in Paris, however, isn't all cream puffs and crepes. Faced with a challenging curriculum and a nightmare professor, Rosie begins to doubt her dishes. Recommended for Grades 8-12. Booklist starred. Romance, cooking. Special Forces, book 1. Danny Manion has been fighting his entire life. Sometimes with his fists. Sometimes with his words. But when his actions finally land him in real trouble, he can't fight the judge who offers him a choice: jail...or the army. Turns out there's a perfect place for him in the US military: the Studies and Observation Group (SOG), an elite volunteer-only task force comprised of US Air Force Commandos, Army Green Berets, Navy SEALS, and even a CIA agent or two. With the SOG's focus on covert action and psychological warfare, Danny is guaranteed an unusual tour of duty, and a hugely dangerous one. Recommended for Grades 7-9. Adventure, military. Debut author! Raised in the Dusklands where her power to create illusions was regarded as a curse, Sylvie has traveled to Coeur d'Or, where the Amber Empress, the cruel Severine, rules in hopes of finding her legacy--but the court is full of dark secrets and deadly intrigues, and Sylvie, now renamed Mirage, must learn to hone her magic, and find her way past the enmity of the empress to claim the place that is hers by right of birth. Recommended for Grades 6-12. Fantasy, adventure, romance. Coyote Peterson, YouTube star, animal enthusiast, and creator of the Brave Adventure series, has tracked down some of the world's most painfully stinging insects and chronicled getting stung by each of them on his YouTube channel. Coyote has saved the best--or possibly the worst--for last, and he's finally ready to share his experience with the most painful sting in the world: the Executioner Wasp. No professional reviews found. Recommended for Grades 3-6. Nonfiction, insects. Graphic novel adaptation of the first book in the Enola Holmes series. Enola Holmes is Sherlock Holmes's little sister. Raised by her mother on the family's country manor, Enola wakes on her 14th birthday to discover that her mother has disappeared, leaving only a collection of flowers and a coded message book. With Sherlock and Mycroft determined to ship her off to a boarding school, Enola escapes, displaying a cleverness that even impresses the elder Holmes. But nothing prepares her for what lies ahead. Recommended for Grades 5-8. Mystery, graphic novel. From their ancient relatives, woolly mammoths and mastodons, to their amazingly versatile trunks and strong ivory tusks, elephants are some of the most fascinating animals on Earth. They are remarkably intelligent, demonstrate self-awareness, and feel familiar emotions like compassion and grief. Recommended for Grades 2-5. Nonfiction, animals, elephants. Minecraft and cooking together? Ready that HOLD button! Minecraft books and cookbooks are among the most popular selections in our PYP Library. This would be a great Christmas gift for young gamers. The Minecrafter's Cookbook makes cooking an irresistible adventure and encourages young gamers to power down and enjoy family time in the kitchen. Recommended for Grades 3-6. Nonfiction, cooking, Minecraft. Little-known facts about elephants accompanied by cartoon drawings, similar to The Truth About Bears and The Truth About Dolphins by the same author. Nonfiction, elephants. Recommended for PK-Grade 2. "Wake up!" says Rufus, a large and very hungry owl. "It's time to catch the fearsome mouse. I'm in a mood for a bowl of mouse soup for breakfast." Pip, who's better at sleeping than swooping, leaps from the nest and lands right on top of that fearsome mouse whose name, he learns, is Theodore. Is it time for breakfast...or friendship? Recommended for PreK-Grade 2.